On our last day in Cleveland a few weeks ago, we had lunch at our hotel before walking down to the Rock ‘N Roll Hall of Fame. My steak salad included hearts of palm which struck me as texture-wise as similar to hard-boiled eggs. I really do miss eggs. Runny eggs for breakfast, over leftovers, or in soup/stews. Hard boiled eggs for salads, sandwiches, and snacks. Raw eggs to add to batter for baking. I’m making it through, but I think anyone who had to give up eggs will agree with me about missing them. The hearts of palm went quickly from idea to plate. That’s how much I miss eggs. My first round topped a salad. The second round was wrapped up in lettuce after my tester said one of her people was curious about it as a lettuce cup. My grocer didn’t have endive to do a nice little cup, so I used Boston lettuce instead and made a wrap. Just as good. My recommendation to you, if you make this, make sure you have diced avocado and toasted pumpkin seeds to go with it. 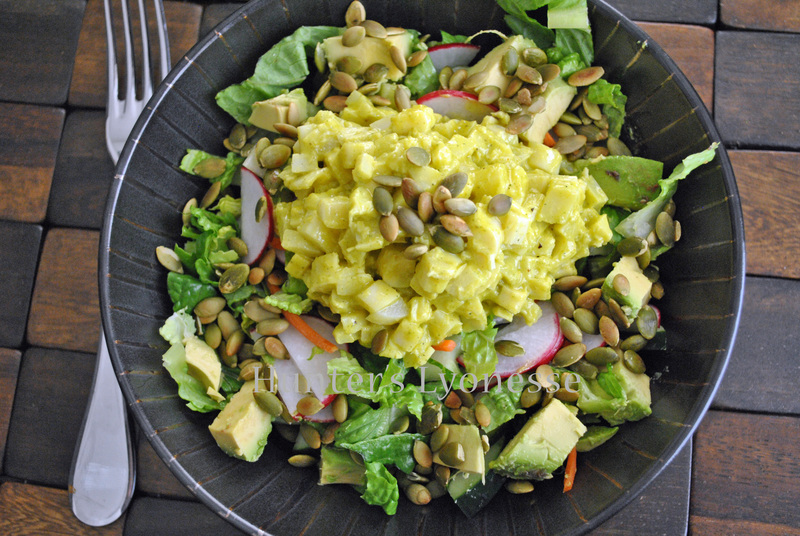 The diced avocado gives it the creaminess that hard-boiled egg yolks would. The toasted pumpkin seeds give it the meatiness. I use ground mustard because I cannot have prepared mustard. If you use prepared mustard in its place, it will have a much different taste. Heat a small pan over medium heat. Add pumpkin seeds and toast until fragrant. Set aside. 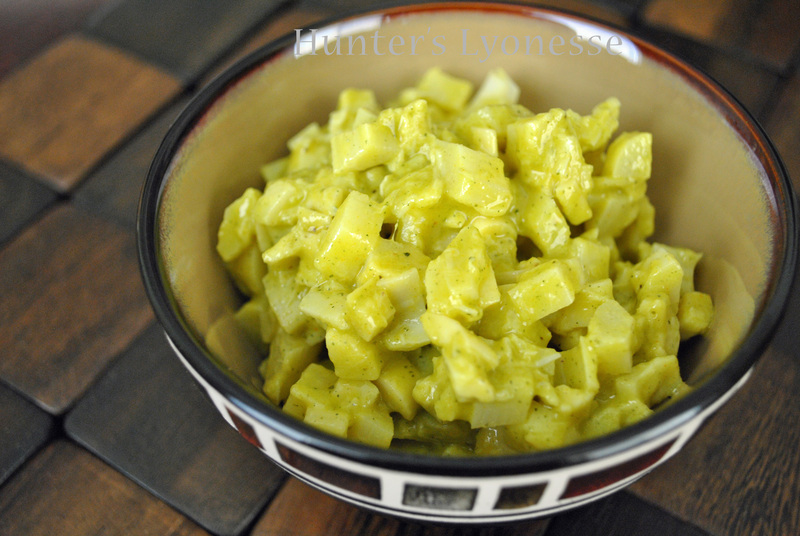 Place diced hearts of palm in a small mixing bowl. In a blender or food processor add half the avocado in large pieces, ground mustard, hemp seeds, 2 tablespoons of the toasted pumpkin seeds, raw honey, turmeric, salt, lemon juice, ground coriander, ground cardamom, and a little olive oil. Start your blender or food processor and remove the center piece of the lid or push through. Drizzle olive oil in until you have your desired consistency. Pour over the hearts of palm and mix well. Refrigerate if you want to serve it cold. Serve over lettuce leaves, on a salad, or between two slices of allergy-free bread. Garnish with the remaining half of avocado and toasted pumpkin seeds. If you want to serve it on the same salad I did in the first picture you’ll need: 2 romaine hearts, chopped; 1 cucumber, de-seeded, quartered, sliced; 5 radishes, halved, sliced, and one cup shredded carrot. This entry was tagged banana-free, crab-free, cranberry-free, dairy-free, egg-free, Eggless Egg Salad, Eggs, gluten-free, peanut-free, pineapple-free, sesame-free, soy-free, sunflower-free, vegan option, yeast-free. Bookmark the permalink. I can eat eggs, but I might have to give this a try because it intrigues me! I’ve never had hearts of palm, but I remember seeing them tinned at the Whole Foods in Tustin, California. They might be sold here, although I’m afraid I’ve never noticed them or at least not paid attention. Cool! We went there when my family and I went to Disneyland. I don’t know if you’ve been there, but it’s a really nice WF and it’s big. That we can do! 😀 And since I know you have a VitaMix, it will be a snap! I have never ever seen hearts of palm in the UK! This is something very new to me! The salad looks great! I used to see them only in Asian markets. They are becoming a little more mainstream here as more grocery stores carry them with the canned veggies now. I love eggs every which way, and I miss them terribly. Worst thing about going vegan was giving them up! I just make an eggless egg salad with soaked cashews as the “eggs”. Love the idea of using hearts of palm. And avocado in egg salad? Oh yum. Oh my gosh, this was wonderful!